I’m finally done with the video review of the 3rd JUKI sewing machine I bought this year! 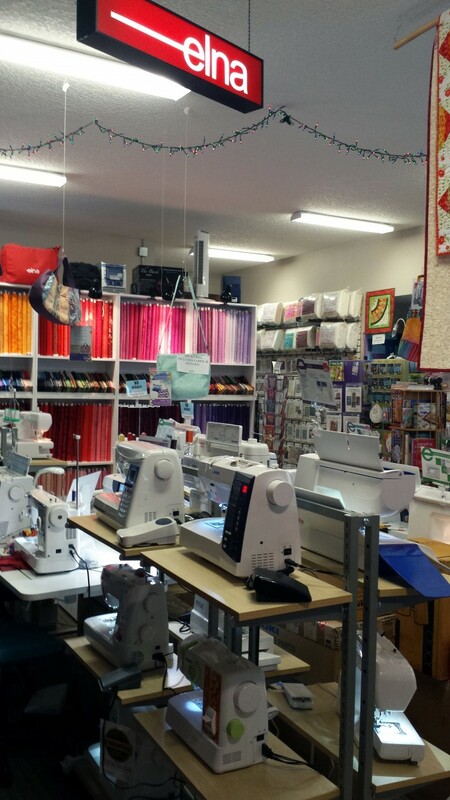 If you missed the others they are, JUKI Exceed F600 and the JUKI MO-1000 serger. Today, though, I’m sharing my review of my all-time most favoritest (is that even a word?!) sewing machine! The JUKI TL-2010Q! This is the baby I use every single day! 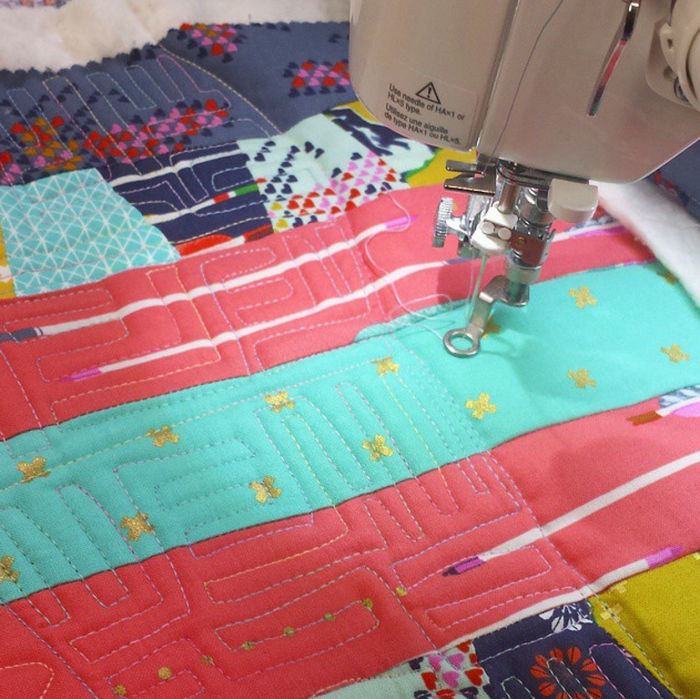 In my opinion if you are a quilter who wants to crank out precise patchwork AND quilt your own quilts this is the only machine you will need. It is a mechanical (not computerized) single needle, lock-stitch machine. That means it doesn’t do zig zag stitches or any other fancy decorative stitches. It only does straight stitching. And boy, does it do it well! 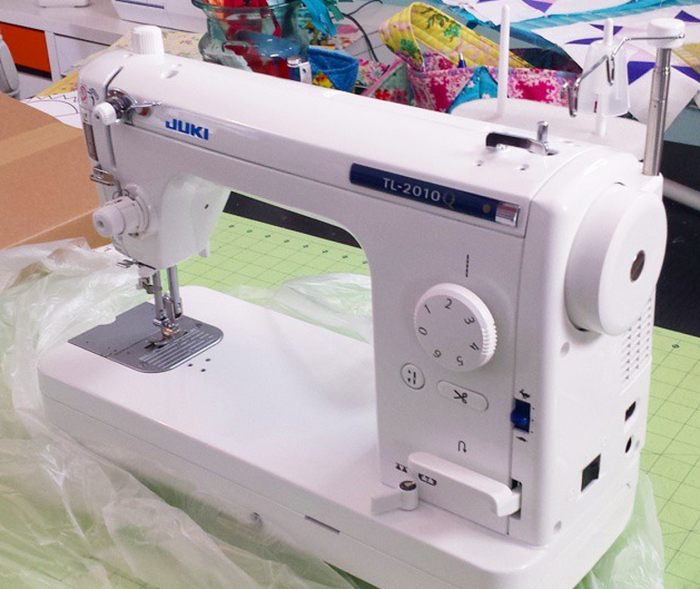 My JUKI TL-2010Q sewing machine! The JUKI TL-2010Q is my go-to machine for piecing. You all know I’m a speed demon and at 1,500 stitches per minute this machine really helps me get my work done faster without sacrificing precision. 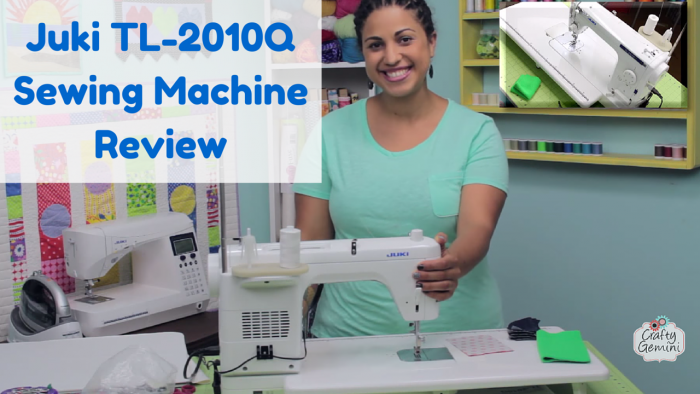 Plus, if you sew and/or quilt with bulky fabrics and need something akin to an industrial sewing machine you’ll want to watch my video review to see how the TL-2010Q performs against some really bulky fabrics! I use this baby every day for all my piecing! This is also the perfect machine for straight line or free motion quilting. So many prominent quilters in the industry use this same machine (Leah Day, Christina Camelli, Melanie Ham, Molli Sparkles, Caroline of SewCanShe, etc.) and although JUKI seems to play it low with their marketing of home sewing machines I think the fact that so many of us are using this machine really speaks to the quality of this workhorse and it’s stitch quality. Speaking of free-motion quilting… if you watch this video review you’ll notice at the end I mention a new free-motion quilting video series. Yup. It’s coming soon. Stay tuned! Peep some free-motion quilting I’ve done on my TL-2010Q! Superb stitch quality! Asterisks on a string design I free-motion quilted on my JUKI TL-2010Q. One of my favorite designs to stitch out. 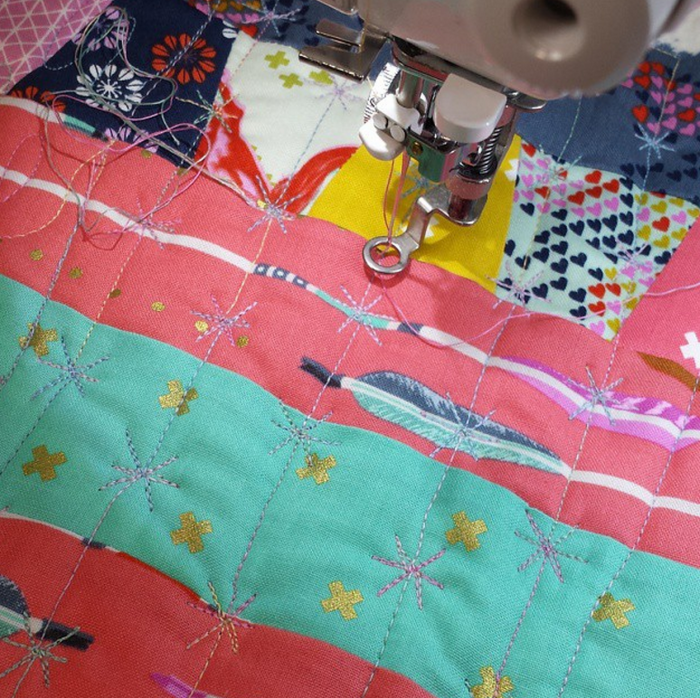 Free-motion quilting on my JUKI TL-2010Q. I bought my machine earlier this year from Timm at Sew-Mini Things in Mt. Dora, FL. 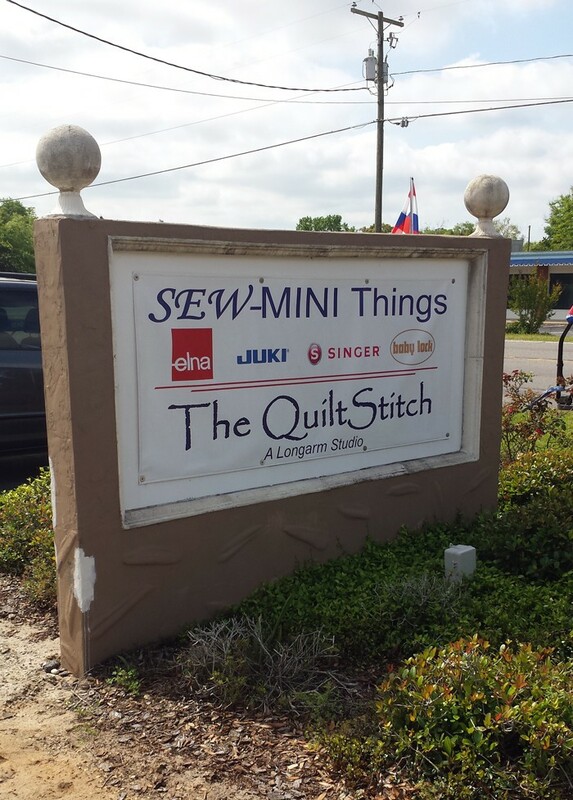 He is a JUKI dealer and very knowledgeable in the sewing & quilting game. He services all the machines that come in his shop and can spend hours telling you about the pros and cons of any machine. If you’re in the market for a JUKI sewing machine I would highly recommend his shop. He even ships his JUKIs for FREE anywhere in the 48 contiguous states! Let him know you saw this sewing machine review on the Crafty Gemini blog! Sew-Mini Things quilt shop in Mt. Dora, FL. Inside Sew-Mini Things. Timm sells all kinds of machines: Juki, Elna, Baby Lock, Necchi, etc. Now I’ll leave you with the video review of my JUKI TL-2010Q. And I will warn you. After you watch this you will probably want to get one. Save your pennies and make the investment. Treat yourself. It’s totally worth it! You can even do what I did and sell some of your older sewing machines off to pay for this new one. You won’t regret it. Enjoy the review and happy quilting! I’m at Missouri Star Quilt Company headquarters! I wish I had this machine! It’s #1 on my Wish List! Would love to see you do some free motion quilting with it. Finally!! A video that CLEARLY shows how to use this unusual needle threader !! Thank you! I recently got a Babylock Crescenda which I love, but there is something about this machine that speaks to me too. Your tutorial made that pull even worse. Thank you. Thanks so much!! I have this JUKI. Only use it for quilting so far. I will watch your video and this may be the stepping stone to use it for piecing. It’s a great machine. I know Timm and the Sew Mini shop.. Tried to buy my JUKI from them but I was impatient and needed it in a hurry. Love their customer service, however, and the friendlyness of all who worked there at that time. Thanks for keeping us JUKIes up to date. Great review! I just recently received this machine as a gift and am loving it so far. Which foot do you prefer for piecing? When I use the edge guided foot, I get more than a scant 1/4″ seam allowance, which affects the accuracy of log cabin blocks and other small scale piecing. The all purpose foot doesn’t seem like it was made to be used for piecing, but it does get me closer to a scant 1/4″. Any advice? WOW! Congratulations! That was a nice gift you received! It is my all-time most favorite machine to use! I love my TL-2010Q. I find that the all purpose foot gives me a perfect scant 1/4″ seam allowance if I just follow the edge of the foot. It’s my favorite to use for piecing. Happy quilting! I think this is what I’ll get for my wife a new sewing machine! Thanks for your review! Hi there! I LOOOOOVE my Juki machines! I have 3 that I use- the TL-2010Q, Exceed F600 and my serger- MO-1000. 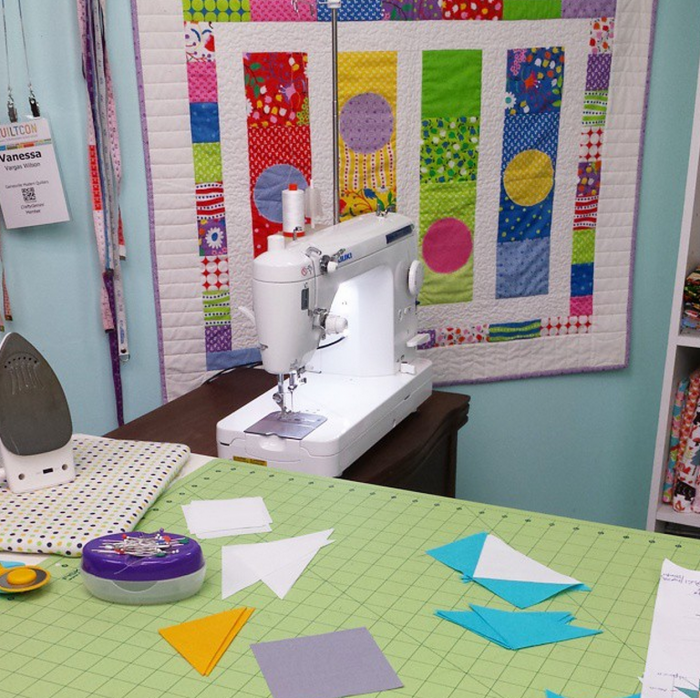 I use BabyLock machines on the set of Crafty Gemini Creates because those are filmed in Missouri and that is what Missouri Star Quilt Company uses and and provides for us. My experience with Baby Lock machines has been limited but the Katherine machine I use there does sew like a dream. I just use my Jukis every day at home and love them! Vanessa, I have this same machine and I’ve had problem after problem with it doing free motion quilting with it. I don’t know what I’m doing wrong with it. I seem be able to free motion quilt fairly well with my Brother innovis 2800 (but don’t like to as I don’t like to put that many stitches on it as I use is for embroidery and sewing work mainly and bought the Juki to quilt with). But I just can’t get the Juki to work well to do FMQ with. Any suggestions? It sews great to straight stitch but for FMQ it’s just a MESS! Shelly, I had a lot of trouble with FMQ at first. If you look up Leah Day’s foot modification that stops the foot from hopping, it helps a TON. You just need an Alan key to be able to modify it. It made me almost totally unable to quilt smoothly when the foot was hopping. It made all my movements jerky and I couldn’t control the speed. I hope this helps! I just bought the Juki TL 2010q this week and so happy I did. I love the simplicity and that it isn’t computerized. All I want to do is piece and free motion quilting. I love it. Your video was so helpful. I will say I was very frustrated with the auto threaded and contacted Juki customer care and they sent me your review video where you show how to thread it with the auto threaded. I still couldn’t get it to work, so I just manually threaded it. But then someone suggested the needle may not be positioned correctly, so I put in a new needle (based on the manual) and made sure it was pushed up as far as it would go. Tried the auto needle threaded again and SCORE! Yay! Finally. Your free motion quilting video #2 was super. I especially liked how you show to start and stop – locking in the stitch, pulling up the bobbin thread to the top, etc. Simple things that long time quilters may take for granted, but a newbie like me plays that over and over to make sure I’m doing it right. Thank you! I have failed at free motion with a Pfaff CS and a Bernina 730. The Juki 2010 works for me. Leah Day’s video review helped. I also bought a Westalee foot and rulers to try and the high shank special foot for my Juki has no spring and works great for free motion. I use Leah’s other recommendations, 75/11 needle, Isacord poly embroidery thread, and her tension settings, but I like a slider and the feed dogs down. I guess everyone has to find the combination that works for them. Wonderful review. I ordered one, it’s coming on Tuesday! Can’t wait. Can’t wait. Can’t wait. Can’t wait. Can’t wait. P.S. The kids are cute! Watch out for that foot pedal! I love my Juki 2010 too. It’s wonderful for free motion, but if you pause to mull over your next move and rest your heel on the pedal, you cut your thread. In addition, never get your fingers in the bobbin area with the pedal plugged in. An accidental tap on the pedal could cause major injury to your fingers. I’m currently trying to have that feature eliminated on my foot pedal. I bought my Juki TL-2010Q about a year ago and I Love it! I have more expensive machines, but this is the one that I use all the time. Love, Love, Love it! Thank you for your review. After shopping for a new machine online I was very overwhelmed with all the options and machines available. For years I have used a Singer Slant O Matic 500 for everything and was concerned no machine would compare. I sew daily, 2-3 hours of an evening and 8-12 hours each Saturday and Sunday. A good straight stitch machine was what I was in the market for. I’ve watched many of your how to videos so I was pleased when I saw your review of the Juki 2010q which was one of a final 3 I had narrowed my list to. You sold it and saved me many more days of reviews and eliminating 2 more machines.. It arrived today and with your review/how to video next to my machine threading the needle was a breeze. As of right now I don’t care for the bobbin placement but suspect that will get easier for me in a couple days. The only thing I don’t understand is the needle up/down and if it can be set to stop up all the time or down all the time. My husband was impressed with the needle threader and the machine as a whole which says a lot. Me, so far it’s great and it won’t be long I will try free motion quilting again. Thanks again for your review. I have this machine and I just tried changing the needle. It took me an hour and it still isn’t in. I am very frustrated with this part of the machine. The needle on this machine goes in sideways so instead of the flat back of the needle shank facing towards the back (away from you) it is installed facing the right hand side. I’m not sure if this is the problem, but it was for me when i first got the Juki. The needle goes in with the flat side on the right, rather than towards the back, and threads from left to right. This was the first machine I’ve ever had that has the needle inserted that way. I still can’t use the needle threader, and yes I watched all the videos! It might need adjustment. I bought the Juki TL 2010Q yesterday and right out of the box, I fell in love with the stitching. Then I did some free motion quilting (after watching your vids!). I’m not very good at it, but the machine was stitching like a breeze. I was very happy. Then I switched back to regular stitching and have not once yet had the original beautiful stitches it had out of the box. I have been searching all over the internet to find a helpful solution, and I’ve tried several things that seemed like they should work, but no matter what I do the bobbin thread makes gorgeous stitches, but the top thread just lays on the surface with a tiny bit of the bobbin thread showing. It looks as if I had couched down the top thread. So, yes, the tension is off. I’ve tried every solution I can find, but nothing works. I’ve changed needles, bobbins, thread, etc. I don’t know what else to do! I hate to think I’ll have to take this back to the shop on Monday. Is there any guidance you can provide. I’m at my wit’s end. I”m having the exact same problem as you with the tension. Right now, I have it at the lowest tension on top and the bobbin gives me a beautiful stitch, but the top looks terrible. I”m so disappointed. Did you ever find a fix? Please let me know, cathyjunga(at) hotmail(dot)com. Thank you! I just bought the TL 2200 QVP and I love it. I think it’s just a newer version of yours! But I can’t find a stitch in the ditch foot for it (has the high shank). Have you found one? I don’t know if you found one yet, but I *just* purchased a stitch in the ditch foot for the Juki at a place called Sewing Parts Online. There’s also a place called Ed Raichert that carries one. HTH!